Okemo! Let's get ready for the next ski season! Keep checking for discounts! 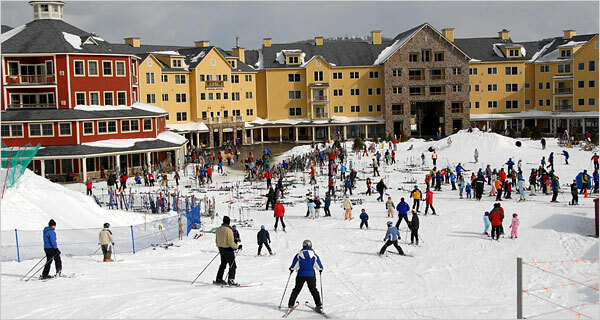 Check out our great Hotel picks and by owner vacation rentals for Okemo! 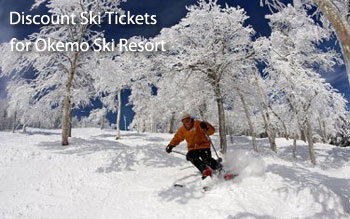 We offer discounts on ski tickets, ski rentals, lodging, by owner rentals, and apres ski ideas for Okemo, Vermont. Okemo Ski Resort rises up above the village of Ludow in South Vermont. It was purchased by Tim and Diane Mueller in the 1980's, who did a great job at making it grow - and then went on to purchase Crested Butte Ski Resort in Colorado! More than half of the trails are for beginners and intermediates, making this a very family friendly resort. Pleease check out the Amp AirBag!!!! Okemo is no longer offering discount ski tickets for the current ski season. Featured: Mountain Lodge at Okemo - Book it! 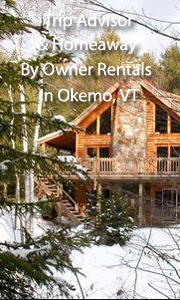 See All our Hand Selected By Owner Vacation Rentals for Okemo! 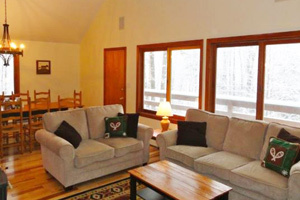 Featured: Walk to Ski Trail on Okemo - 4 bedrooms - 2 baths - sleeps 10 - from $200/nt -- Book it! The Okemo House, fully renovated in 2012, is the consummate Vermont ski chalet, located just steps from the base lodge of Okemo Mountain in Ludlow, Vermont. With beds to sleep 10, this home is on a private wooded lot with views of the Okemo ski resort and is a spacious 2,000 square foot home with 4 bedrooms, 2 full bathrooms and two large family rooms. With an open-concept living room, dining room and kitchen, the home has two wood stoves, cable and wireless internet, and a large hot tub on a beautiful private rear deck. Location is everything for this home -- we are just 2/10 miles from the Okemo Mountain base lodge and 1 mile from downtown Ludlow. 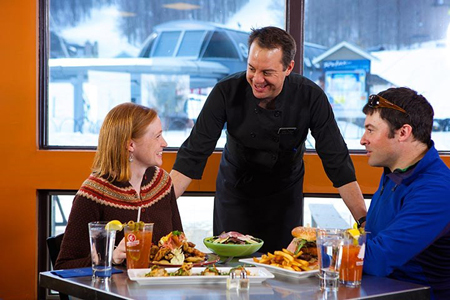 For skiers, take a short walk down to the base lodge OR hop on the shuttle! We are directly on the Okemo shuttle route -- you can be picked up right at the end of the driveway. No hassles or packing up the car to drive to the ski resort! With a great location and a beautiful home with all of the amenities, this is the perfect home for your weekend or week-long rental! Apres Ski Ideas - near Okemo! 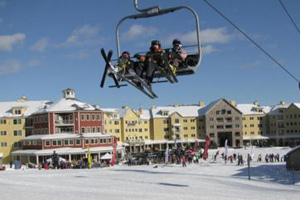 Okemo offers up 624 acres of skiable terrain served by 12 chairlifts. Five terrain parks will keep the park lovers happy. As such, Okemo is a great place for skiers and riders of all types. The resort boasts of its great snow quality and 2200 feet vertical drop. It has all the things you would expect at a big resort, different areas catered to different styles. The left and right side of the mountain is filled with black diamonds. At each base log different level beginner areas (one with some terrain parks mixed in. The main part of the hill has mostly advanced and intermediate slopes and many different types of terrain park, including a entire run-long “Amp Energy Super Park on Nor’Easter” and a laser guided superpipe.